Just wanted to post a brief commercial for the live blog I'll be doing tomorrow night (Thursday) at the Consol Energy Center for the highly anticipated Penguins-Flyers tilt. The live blog should probably start in the 6:00 hour if I had to give an educated guess. 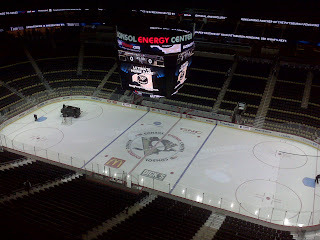 I've done one other live blog in my life, and that was the first time I was permitted into the media area at the CEC. It was a little different from the usual Pens live blog you see around the web, and the second take will once again be along those lines. So I hope you can join me at some point for an historic evening in Pittsburgh. -The Penguins will enter on a red carpet, with fans invited to arrive in time for the players' entrance between 4:15-5 p.m.